We believe that pharmacy services are essential to the integrated health model. Pharmacy services are available to all patients receiving services within Colorado Coalition for the Homeless. We provide full-service pharmacy at Stout Street Health Center, while West End Health Center has a dispensing outlet where patients can pick up prescriptions that are filled at Stout Street Health Center. We also provide medication management and pillbox services to help you organize your medications. Our pharmacists can give out flu shots as well. We provide pharmacy services in either English or Spanish. We also accept Medicaid and Medicare Part D plans. Our pharmacy provides both prescription and over-the-counter medications to our patients. However, we do not stock any narcotic drugs. If prescribed, those prescriptions need to be filled at a commercial pharmacy. You can save time and refill your prescriptions by using either the patient portal or calling the telephone refill line: (303) 293-6516. We require 24-48 hours to process refill request. This allows us to check your insurance, or make request and receive refill approvals from your provider. Our pharmacy team consists of pharmacists, pharmacy technicians, and PharmD interns from the University of Colorado and Regis University. On average, our pharmacy team fills 500 prescriptions a day. In 2015, the pharmacy filled over 110,000 prescriptions. What should I expect from a visit to the Pharmacy? 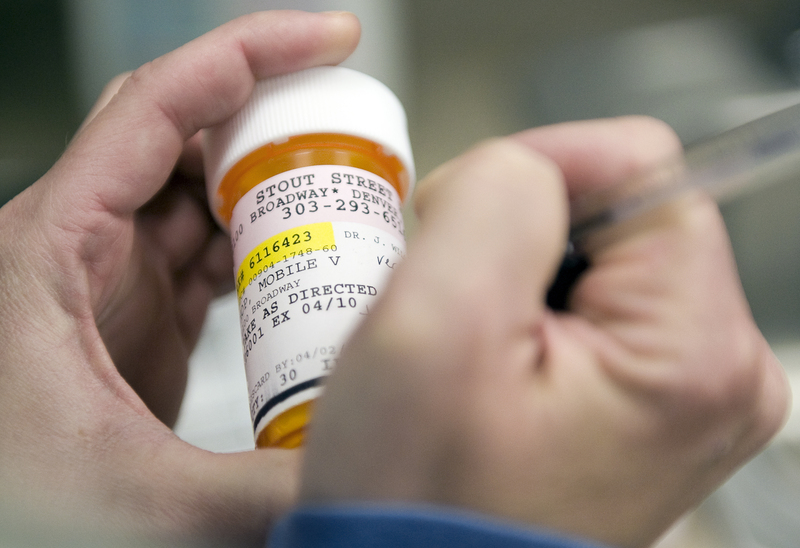 For new prescriptions and refill requests, patients should first go to the check-in window and provide their name to the pharmacy technician. The pharmacy technician would make sure that we receive their prescriptions electronically from the provider or that there are refills on their medications. Typically our wait times are anywhere from 20 to 45 minutes, depending on the number of prescriptions. Once the prescriptions are ready, the patient's last name would display on our TV screen in the waiting room. Patients can then go to the pick-up window to retrieve their medications. This is also where patients are offered counseling should they have additional questions about their medications.